strike – Write. Snap. Click. Cape Town, November 9, 2018 – A prolonged strike and political instability in the DA led city council, threaten the safety of commuters on Cape Town’s MyCiti buses. Several incidents of arson across the city have resulted in buses being torched, forcing police to act as escorts on some of the routes seen as high risk. eNCA’s Pheladi Sethusa has the details. Cape Town, October 9, 2018 – eNCA reporter Pheladi Sethusa is outside a Sassa office in Eersterivier in Cape Town. NOTE: Article first appeared on The Citizen website on September 3, 2014. There is no end in sight to the ongoing Generations drama as the popular soapie enters the fourth week of no filming. MMSV Productions owner and Generations producer, Mfundi Vundla threw a spanner in the negotiation process with the 16 fired actors when he reportedly jetted off to Mackinac Island in Michigan, the United States of America over the weekend. Vundla reportedly said he was going away to think of the new direction the show would take, adamant that he would not be taking back the 16 who “betrayed” him. Seemingly following in Vundla’s footsteps, actor Thato Molamu, who plays Nicholas Nomvete has also taken steps to change his situation. He has landed a hosting job on SABC 2 show, What’s Behind The Wall? He was reportedly on leave like a pregnant Katlego Danke when he got fired. 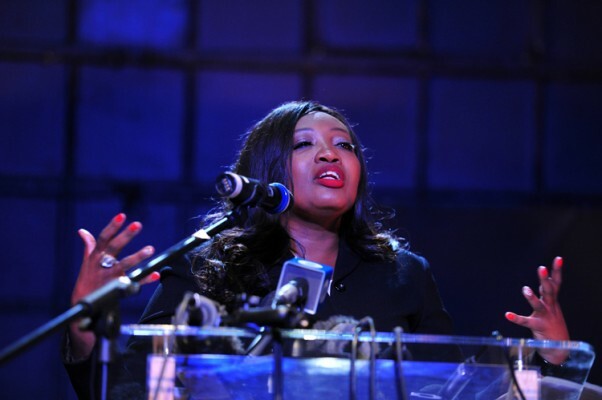 The last move made in this standoff between the actors, their production company and the SABC came last week Thursday. The actors sent a letter to the SABC requesting a time and date to meet again to possibly start negotiations. The actors legal representative, Desmond Brown said some of the other fired actors had also started looking for “other gigs” while waiting to solve their dispute. Winnie Modise, Sophie Ndaba and Nambita Mpumlwana did just that when they attended the Women in Sport awards evening hosted by the department of sports and recreation last week. Ministerial spokesperson, Anda Qhama Bici said the three “were invited as guests, they weren’t making an appearance”. Last week the fired actors received partial salaries because they have not been at work since August 11. They are demanding a cut of the show’s royalties and three year contracts. At the moment pre-recorded episodes of Generations are still being aired, but there are only two to possibly four weeks’ worth of episodes left that are ready to air. NOTE: Article first appeared on The Citizen website on August 27, 2014. Sixteen actors from the cast of Generations came out strong on Tuesday afternoon, insisting they will not go to work until “their demands are met”. At a media briefing held at the Market Theatre in Johannesburg, the 16 dismissed actors banded together to finally give their side of the story. Nambitha Mpumlwana who acts as Mawande Memela gave a brief financial run down of what a “supposed R55 000″ salary would look like after deductions. She said after tax, agent fees and retirement annuity payments the actors would get a little over R19 000 – with which they would have to “pay rent or a bond, a car payment” and more. A meeting with SABC, production company MMSV and the minister of Arts and Culture, Nathi Mthethwa yesterday did not prove fruitful. Patrick Shai – who acts as Patrick Tlaole – announced they were told further talks would only happen if the actors agreed to do so without their legal representatives. A week of mass strike action has seen 16 principal actors from Generations supported by the ANCYL and department of Arts and Culture. Now Dr John Kani has asked the nation to support their cause. A number of the actors who stepped up to the podium to address the media broke down in tears when speaking of their working conditions. Menzi Ngubane who acts as Sibusiso Dlomo came out as the person Mfundi Vundla had paid hospital fees for. Ngubane was hospitalised for kidney failure. He said he spent seven weeks at Helen Joseph public hospital and Vundla would not have him moved to a private hospital. After being discharged he paid R30 000 back to a friend for his medical fees. “I was discharged on a Thursday and had to go back to work the following Monday. Sitting down on a chair between the six to 10 scenes we shot a day,” said an emotional Ngubane, who had others on stage in tears. Pre-recorded episodes of the show are currently keeping the soapie on air but these recordings will only last for a few more weeks. The direction of the show is unclear at the moment with Vundla alluding to “new talent” as a strategy that may be used to take the show forward should matters with the 16 not be resolved. 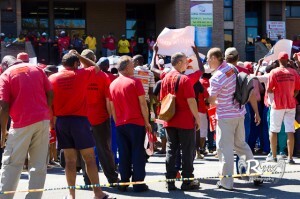 Thursday 19 July 2012 marked the beginning of the Wits staff industrial action against management. The main issue of protest is against the low wages that staff members at Wits are paid. The strike came to my attention on Twitter via Professor Pumla Gqola’s timeline. Her hashtag#WitsStaffIndustrialAction was very useful in highlighting the staff’s main issues of contention. 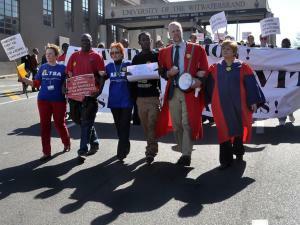 Members of ASAWU (Academic Staff Association of Wits University), NEHAWU (National Education Health and Allied Workers Union) and ALTSA (Administration Library and Technical Staff Association) joined forces to propel the protest. Wits staff marching outside the university’s entrance on Enoch Sontonga road in Braamfontein. This was what they called a yellow card march, pending a response from management. If their demands are not met, the strikers threaten to enforce full industrial action on the 2nd of August. The groups feel that considering the surplus profits that Wits makes they are entitled to increases. They are demanding a 9% wage increase for support staff and a 7.5% wage increase for academic staff. Along with this was a demand for an on-campus childcare facility, increased amounts for individual research and an end to the overselling of open staff parking areas. These demands are by no means preposterous or absurd; the staff members simply want decent pay for the work they do. Especially when there is enough money in the University’s coffers to do so. Every year students pay increased fees and the government grant is increased. It only makes sense that staff salaries should also increase. At the moment increases are granted on a performance basis but this can judged very subjectively and is not necessarily the fairest way. The memorandum handed over was accepted by management and will be taken into consideration, they say. Hopefully, management will heed staffs call by adhering to their demands. Our staff is very capable and deserving of this increase for the phenomenal work they do. **NOTE: Post first appeared on exPress imPress on July 23 2014. The e-toll issue has been a rather contentious one. Since early last year when the announcement on the Gauteng Freeway Improvement Project (GFIP) was made (emphasis on announcement), both SANRAL(South African National Roads Agency Limited) and the government failed to even propose the idea to the general public. Surely citizens deserved consultation before the tolls were even built. Now that the public is speaking out against the tolls, they are being vilified. The e-toll saga reached its climax when the budget speech took place a few weeks ago. For months the launch of the tolls had been postponed due to public outcry. In the 2012 budget speech, Finance Minister Pravin Gordan made it clear that e-tolls are here to stay. He said that it is the responsibility of Gauteng taxpayers to pay and that the price cut was very generous on their part. Initially, the tolls were set to be 66c a kilometre which could see daily commuters paying up to and over R600 a month. Coupled with petrol money and service fees, driving would become an unbearable cost burden. Gordan considers the price cut from 66c to 30c per kilometre and the R550 capped fee for regular users as generous. There is nothing ‘generous’ about an added expense to road users. The problem with the e-tolls is that they have already been built and people have been hired to work in the e-toll shops at various malls. If the tolls were just ‘scrapped’ as many are suggesting, hundreds of people would be unemployed. This is the emotional blackmail the Minister used in the budget speech. What he conveniently forgets is that if SANRAL hired those people, they are responsible for them. It feels like SANRAL in collusion with the government have bullied the public into a corner. This is not how democracy should work. Why do we even need these e-tolls? The justification is that the money made from e-tolls will be ploughed back into road infrastructure and aid other national expenditures. Fine. But then what are all our other taxes for? They increase every year; yet it is hard for us to see this money being used efficiently. If I knew that my e-toll money went towards someone’s grant money, building schools and the like I would happily pay it. But I know better and so do you. That money will line the pockets of some fat cat and never be used for what it should. The government is taking advantage of us and we cannot allow it. 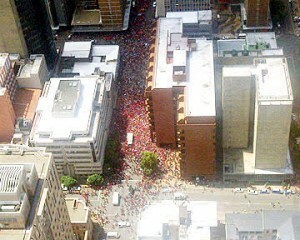 This is why I was in full support of the COSATU strike last Wednesday. Since the inception of the GFIP, Zwelinzima Vavi has been very vocal on the matter. He thinks that the tolls are an unnecessary burden, especially to the ordinary working man. He has encouraged commuters to boycott the e-tolls by not registering for them; something that could have heavy penalties (apparently). His comment after the budget speech was that citizens are being used as cash cows and this must be put to a stop. The strike/march on Wednesday was the first decisive measure to protest against the tolls. It was a very peaceful strike which garnered support from an estimated 60 000 people nationwide. The e-toll strike was held in collaboration with COSATU’s protest against labour brokers. What was most poignant about this strike is that among the strikers there were some white middle class citizens; a very reassuring sight. The response to the strike had the same adamant tone as it did before. It was said in parliament the following day that they will not be making any changes; their decision regarding the tolls was final. COSATU say they will not rest until further concessions are made before April. For commuters’ sake I hope they don’t; these tolls are an unfair burden. **NOTE: Post first appeared on exPress imPress on March 14 2012.